Andrews Automation are offering an innovative chain conveyor system which is simple, robust, reliable and is subject to less wear. Therefore increasing productivity and reducing maintenance. Easy assembly and dis-assembly as it works like a kit. The chain conveyor is outstandingly simple, robust and reliable. The complete system is based on rollers. Due to the systems design, it is subject to less wear and tear. The complete system is low on maintenance and extremely durable. The chain conveyor enables long conveyors of up to 300m with just one drive. Offers low energy consumption due to the reduced numbers of drive motors. The system is ideal for large unit goods of up to 50kg. Fast speeds of up to 1.5 m/sec allows for efficient transportation of items. The conveyor is available in stainless steel, allowing it to be used within the beverage industry for example. Due to its simple design and speed it increases productivity. Cuts investment costs and TCO. An ingenious rolling principle (which is therefore low on friction) in a C-shaped profile is used to direct the deniway chains. 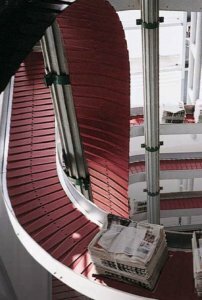 The joint between the links makes the plate chain conveyor flexible in all directions. deniway is also designed as a kit. The three basic components, consisting of a C-shaped channel, plate chain and return, usually cover standard requirements. This level of simplicity makes planning easier and even designing complex round sections is not difficult. Engineers are amazed at how easy it is to plan and install entire (and complex) conveyors. deniway meets the challenge posed by horizontal and vertical changes of direction, curves, complex sections and large unit goods. Industrial material flow can only benefit from a drop in energy consumption and decreasing maintenance and operating costs. Productivity is the only aspect that increases, and by a huge factor if experience is anything to go by. This is Denipro‘s definition of sustainability and products made to last. The sections of the channel consist of 2-mm-thick sheet metal. They are connected with flanges – so that the high-quality plastic rollers move in it with ease. They can be fitted extremely quickly and without any problems. Changes are easy to make at a later date. Each of the bogies on the plate chain transfer the force via a chassis made of two steel bands. A cast-iron component riveted on connects the support plate and lateral roller. Standardised components are also supplied in addition to the basic C-channel, plate chain and return. Supports and side guidance plates are some of the accessories, as well as screws, tube guidance systems and clamps. Peripheral equipment can be added to the conveyor, for example in-feed belts, or pushers and dischargers. Components made by other manufacturers are also easy to integrate. One single system is all that’s needed for a whole conveyor and all processes can be controlled from one central point. Andrews Automation are a dedicated Trade Partner to Denipro and can offer their complete range of conveyor products. For more information on Denipro please visit their website or contact us for more information. 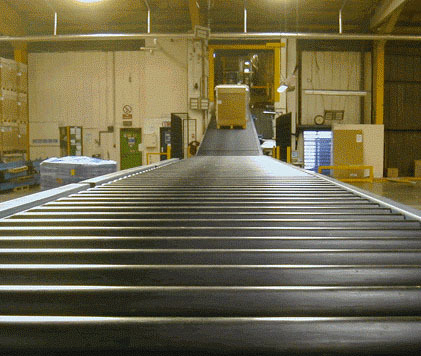 Could a conveyor system be the perfect investment?